If you can make it out of the Valley unscathed, you’ll stumble across a foodie heaven. Whether you’re brunchin’, lunchin’ or just drinkin’ – jump on the ferry and cruise into New Farm. It’s time to get up and gyo-za, because have we got some news for you. Sea, weed be cruel to not share this rad little Japanese restaurant tucked away on Brunswick St. With a menu that’ll make you more indecisive than bridezilla at a cake tasting, Yuzo & Co combines affordability and taste – leaving you wanting more every time (my belt’s telling me no, but my mind, my mind is telling me yes). If you’re doubtful, mayo we hit you with this truth bomb – for just $37pp, you can grab a 5-course meal. Yeah, we know. The name might be little, but the flavours at Little Loco are anything but. Located in the heart of New Farm, Little Loco is serving up locals insta-worthy brunch and lunch. 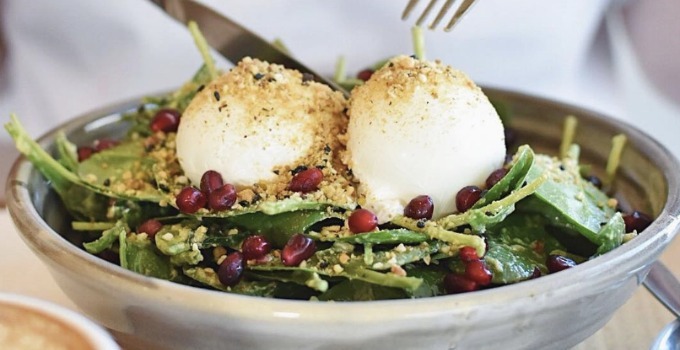 Embrace your #fitspo (or #fakespo – we don’t judge) and try the Green Bowl, with kale, avocado, pomegranate and poached eggs, it’ll make you forget that 3am cheeseburger you NEEDED. Wash it down with an oreo or snickers milkshake, because it’s all about balance. A New Farm institution, The Moray Café has held a special place in our heart. She might have had a makeover, but she’s always been beautiful to us. Open for breakfast, lunch and dinner, the cafe offers up delicious options like breakfast panna cotta, twice baked crab and gruyere soufflé, pan fried quail and porcini mushroom risotto. Complete with a great wine list and scrumptious desserts, The Moray Cafe has it all. As close as you can get to France without leaving Brisbane (why would you want to?) Chouquette is the real deal. Specialising in artisan breads and pastries, all the products are handcrafted using authentic French methods. Put on your best beret, grab an éclair or a fresh baguette and enjoy it overlooking the Brisbane river. If you squint, it’ll almost look like the Seine! The start of every good New Farm picnic needs a bottle of rosé (or three…), and a trip to New Farm Deli. Forget Kraft singles and packet salami, with over a hundred cheese varieties and one of Brisbane’s most extensive range of meats and delicacies you’ll be spoilt for choice. There’s also a café attached which does some of the best pasta and coffee in Brisbane. So grab your blanket, borrow a dog and tell your friends you’ll meet them by the river. It might be the new kid on the block, but we’re not picking any fights with The Brunswick Project. Forget about owning a house, who needs responsibility? We’d rather smash our faces into avocado, especially when it’s accompanied by feta, radish, dukkha and poached eggs. Need an extra kick to get you going? Claudia’s baked eggs with spiced beans will heat things up. For lunch we can’t look past the reuben, with thick cut pastrami, saukreaut and mustard on toasted sourdough. What’s better than Italian? Italian accompanied with spritzes! And no one does that quite like Bar Alto, with riverfront views making it the ultimate lunch date or Sunday sesh. Grab friends, book a table on the balcony, and spend your afternoon devouring bowls of chilli garlic mussels. The menu is packed with modern Italian dishes and share plates like braised lamb shoulder and pork spare ribs. The pick of the pastas? Crespelle with ricotta, pumpkin and burnt sage butter.